LOS ANGELES (AP) — Two City Hall veterans claimed spots Wednes­day in a runoff for mayor of Los Angeles, setting up a confrontation likely to turn on personality and style since the Democratic pair share much of the same policy turf. City Coun­cilman Eric Garcetti topped the field in Tuesday’s election, carrying 33 percent of the vote. Since no candidate cleared a majority of the vote needed to win outright, he'll face Controller Wendy Greuel in the May 21 matchup to replace exiting Mayor Antonio Villaraigosa. She had 29 percent, accordingly to preliminary returns. Meanwhile, in a decision that will hang heavy on the next mayor of the financially troubled city, voters knocked down a proposed increase to the city’s sales tax — a half-cent boost to 9.5 percent. The measure was defeated by a double-digit margin, returns show. Greuel promised to “work on the tough issues like education and jobs and getting LA back on track.” In an interview Wednesday with KNX-AM radio, she offered little in the way of specifics about how she would invest in street repairs and other programs starved for cash while contending with rising employee costs and a shaky budget. “It’s about priorities,” she said. With all precincts reporting, along with a partial count of mail-in ballots, Garcetti and Greuel were followed by Republican Kevin James, with just over 16 percent, and Democratic Coun­cilwoman Jan Perry, who was a fraction behind him. Several candidates trailed far back. The city appears headed for another first at City Hall. 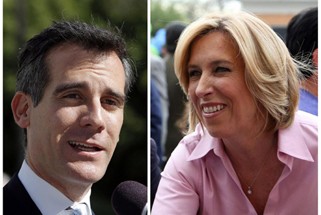 Greuel could become the first woman mayor, and Garcetti could become the first Jew elected to the post (but not the first to hold it in a temporary capacity). The two candidates have roots in the city’s San Fernando Valley. The election capped a lackluster primary campaign that was snubbed by most of the city’s 1.8 million voters. Turnout was scant. Preliminary figures pegged turnout at 16 percent, though an unknown number of mail-in votes remained uncounted. Garcetti claimed the top spot, even though he failed to clear 100,000 votes in a city of nearly 4 million people. The next mayor of the nation’s second-largest city inherits a raft of problems: Crime is relatively low but City Hall is nearly broke, the airport is an embarrassment, freeways remain clogged and potholes, cracked sidewalks and untended trees infest many neighborhoods. Rising pension and health care costs for workers threaten dollars needed for libraries, street repairs and other services. “The city’s ability to provide services that improve the quality of life of city residents has diminished,” city Administrative Officer Miguel Santana wrote in a report last month. Angelenos are known to give local politics a collective shrug, and turnout failed to reach 30 percent in Villarai­gosa’s hotly contested primary in 2005, when he was trying to become the first Hispanic mayor in more than a century. He was re-elected in 2009 with a meager 152,000 votes, in a city of nearly 4 million people. The leading candidates dueled mostly over pocketbook issues and City Hall insider politics — a looming deficit, 10.2 percent unemployment, the grip of municipal unions. The Los Angeles mayor presides over a budget that exceeds $7 billion, but it is a comparatively weak office hemmed in by a powerful City Council. Unlike other big cities such as New York, the Los Angeles mayor cannot directly appoint the head of schools or police.